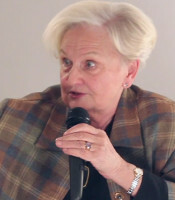 Ewa Łętowska is a Polish lawyer and senior professor of law at the Polish Academy of Sciences’ Institute of Law Studies. In 1987, Ewa became the first Polish ombudsman, a position she held up until 1992, becoming a Supreme Court judge at the end of the decade, before then moving on to the Polish Constitutional Tribune in 2002. Ewa retired from this role in 2011, but remains active as a professor ordinarius at the Polish Academy of Sciences and as a member of several associations. Outside of these roles, Ewa has also lectured at Paris’ Panthéon-Sorbonne University and is a member of a long list of illustrious associations, including the Helsinki Committee’s Committee of Experts, the Council of the European Foundation of Human Rights, the International Commission of Jurists and the Academy of Comparative Law in Paris. Ewa is well published and has written more than 300 books and articles. She has also received several distinctions for her services and her awards include the Friedrich Ebert Foundation’s distinction for human rights work, the Commander’s Cross of the Order of Polonia Restituta and the Polish Red Cross’ Red Cross of Honour. Her latest publication was Nieuczciwe klauzule w prawie umów konsumenckich [Unfair Clauses in Consumer Contract Law] (C.H. Beck, 2004; 2005).